For Sheri’s kid. I would donate a kidney for hair even half that awesome. Pattern is this. Fabric is Alexander Henry, I believe. It’s been in my stash for at least a year, possibly two. Very cute! 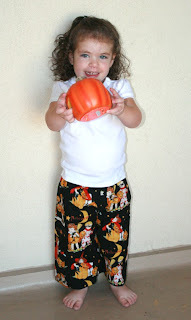 My sisters and I used to love making pajama-type pants when we were growing up (well, I would have them make them for me). The stripey material in my post came from Joann in the quilting section. We just got it a couple of weeks ago from there. We would have done the stripes on the outside, but we were both afraid of trying to match up the stripes. And yeah, her own mother would give a kidney to have hair like that. Thick, curly hair, blue eyes…still not even sure she’s mine. love that fabric, and that kid. I need a halloween costume for work, wanna make me one?